Metal Buildings of Alabama - Carports, Barns, Workshops, and more! We offer custom made buildings of all sizes. Larger, Taller & Stronger, Certified Buildings. These metal buildings are great for boat covers, carports, RV covers, equipment storage, workshops, maintenance buildings, garages, and more. Sizes from 12' x 18' to 40' x and up'. The Best & Most Avoidable Barns on the Market ! Sizes From 28' x 20' to 48' x 40' and larger. 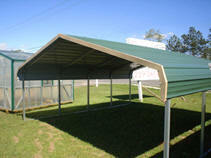 Workshops & Storage Buildings of Virtually any Size or Configuration! Whatever your needs, we can build a custom made, certified, metal building to meet or exceed your needs. Payment options include, cash, check, VISA, MasterCard, or our in house financing.